Home » Best Juicers » Juicer Price: Do You Get What You Pay For? 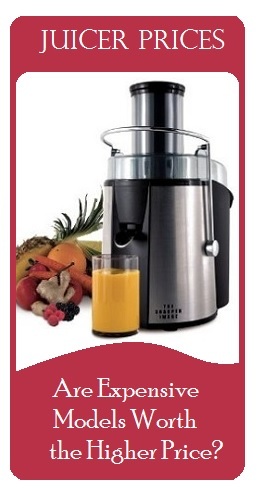 When looking at a juicer price, you are comparing juicers that cost anything from $20 to thousands? Do you really get what you pay for? When comparison shopping for any product, it is often suggested that you throw out the lowest and highest prices available. This is a good strategy when shopping for juicers, since many of the low priced juicers are very inefficient and many of the high priced juicers are not efficient enough for the price being asked. How much you spend on a juicer depends on your expectations and needs, but for the most part many of the best juicers fall toward the middle of the market around the $300 to $500 price range. There are duds in all price ranges no matter what product you are shopping for, and juicers are no different. There are juicers selling for over a thousand dollars that leave very wet pulp behind or which tend to break down within a year. There are also very efficient juicers that sell for a couple hundred dollars. You cannot assume that the price on the machine is equivalent to the efficiency and value of the machine in your kitchen. The best way to find the duds in the juicing market is to read juicer reviews before making a purchase. If you read what others have experienced with a machine, you will know what to expect from that machine in your own kitchen. Once you accept that there are duds in all price ranges, it is time to start the comparison shopping process. If you know how to rule out the machines that aren’t efficient, you do get what you pay for in the juicing market. Under $200: citrus or wheatgrass only juicers; low quality centrifugal juicers for occasional use. $200 to $500: masticating and twin gear juicers; more extra features; higher efficiency for heavier use. $500 to $1,000+: high end commercial juicers for heavy use; juicers designed for raw foods diets, cancer prevention, and other serious uses. The amount you should spend on a juicer depends on how often you will be juicing, what you will be juicing, and what you would like your machine to do besides juicing. Lower priced juicers are only suitable for occasional use and tend to squeeze less volume from produce, which means you throw a lot of nutrients in the trash at the end of the juicing session. Centrifugal juicers are heavily represented at the bottom of the market and do not work well with citrus fruits, wheatgrass, or leafy green vegetables. Juicers toward the middle of the market tend to be the multi-functional twin gear and masticating juicers that serve as food processers as well as juicers. Most of these will work better with citrus fruits and leafy greens, but many users still prefer lower priced citrus and wheatgrass juicers in addition to their regular juicer. You should get dryer pulp and better warranties in these mid-market price ranges. Extremely high priced juicers, like those used for the Gerson cancer fighting diet, tend to offer enhanced functionality and extreme efficiency. You should get every last drop of juice from your produce when paying thousands of dollars for a juicing machine. These are machines that you purchase once in a lifetime and pass down to your children. The higher or lower you go in price, the more you have to scrutinize the efficiency of the machine and make comparisons to other juicers on the market. You can’t expect too much out of a very low priced juicer, yet you can’t assume a very high priced juicer is superior. Remember, there are duds in every price range!